Catching the Last Rays – And Looking Good Doing It! August is here, meaning that, for most of the country, days at the beach are numbered. Still, there are rays to be caught and friends to spend time with, so why not do so in style with these great summertime accessories? With all this in mind, we here at Zenni came up with a fabulous outfit you can rock at any beach- built specifically around our stylish polka dot frames of course! These polka dot glasses have been selling like hotcakes and we aren’t surprised. Everyone loves these full red frames with white dots. As cute as they are with regular lenses, they are simply dynamite as sunglasses! Quite affordable at only $25.95 from Zenni. Try wearing red lipstick with these glasses for a seriously stunning face! In keeping with the polka dot theme, we found this incredibly cute bikini top at Forever 21. Only $9, and you have the option of buying a matching or contrasting bottom to go with it. Of course, you can just choose the top and pair it with jeans, a maxi skirt or even a sarong. These beige flip flops go with everything and offer your feet protection from the hot sand. Made from patent leather and a rubber sole, they’re available from TKEES for $50. 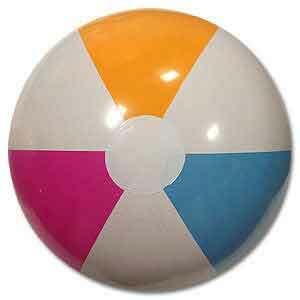 Bring out your inner child with this adorable, classic beach ball from Beachballs.com. Only $1.88 each, buy several and turn each beach outing into a party! This may be the cutest beach towel we’ve ever seen. Cool colors offer some relief from the heat, while declaring your love for salt water. Even better, you can monogram your towel to make it uniquely yours. $24 from PB Teen.